after a couple of days I couldn't resist the urge any longer and started drawing up a schematic. that there seemed to be a difference between muses (they also have different colored lights). gate is used and it is based on the examples found here. input bit is selected with switches W, X, Y Z which are connected to a parity generator made with 3 XOR gates. shiftregisters and XOR gates actually foms a LFSR which could create some pretty long sequences. Chromatic Melody Generator. Switch D is used to select the octave (0 = one octave lower) which is done with U10b. switch A or actually the lowest note in the sequence. Although I think that would be rather hard to implement. registers. I was actually thinking about making a mini-cmuse. Great you figured it all out PHOBoS! This one I do understand at least. Re. the parity generator, odd parity seems more interesting than even parity, I've added an inversion for that after the xors. When the W, X, Y, Z switches are all switched to a position beyond the divider signals, and the shift register holds all zeros the xor yields a zero too - meaning the shifter state never changes. Maybe this is the case for the original .. but I've found things to be a bit more interesting with the inverter added. Now I need to figure out a good way to generate an output signal - I've implemented the thing as a controller, that is, it has no oscillator of it's own but just the weighted outputs of switch_a .. d summed (a DAC, say, or an R2R ladder). Wow, I totally missed this post for months. I had a read of the Muse programmers manual and I noticed a couple of things. Blue Hell's intuition about odd parity is correct. At the bottom of page 2 it explicitly says that when all the theme slides produce 0's a one is clocked in. In the section on tempo at the bottom of page 7 it says the tempo is doubled when you use the C1/2 setting on the sliders. 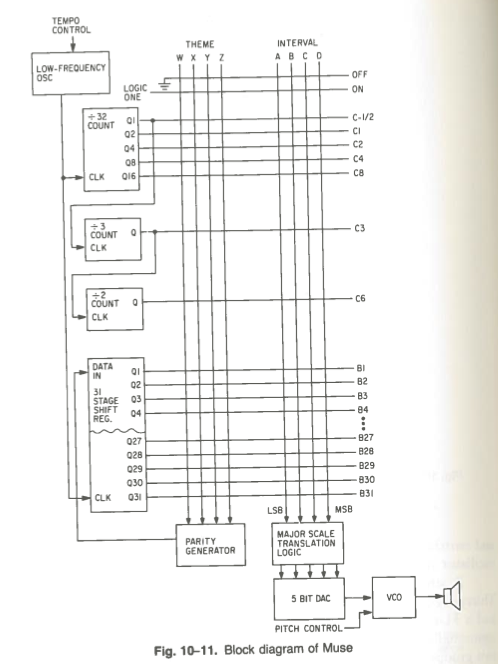 This suggests the the raw oscillator is presented as C1/2 and then divided by two for the master clock C.
The description near the top of page 2 concerning note generation clearly talks about dividers so your implementation is clearly in keeping with the original. At the bottom of page 2 it explicitly says that when all the theme slides produce 0's a one is clocked in. If I am reading it correct it seems the programming manual is actually contradicting itself. Since all Theme slides had a zero on them prior to the first beat and no ones is an even number, a one was shifted in. If the four Theme slides have an even number of ones on them (i.e. 0, 2, or 4), then a zero is introduced into the first bit of the shift register at the next tempo beat. another XOR gate and you can even control it with a signal). The chiptunes circuits by Synaesthesia and others interest me and this circuit as well as the related Psych Tone circuit touch an itch I am trying to scratch. But I want something that can develop melodic sequences and then elaborate on them rather than spewing out random tones. I've been thinking about a set of 4 x 8 bit latches that hold a sequence of 8 notes that can be scanned by a 4051 clocked at the note tempo. This gives a repeating 8 note motif. It should be possible to set up a table of key changes and other variations that are periodically used to update the latches with new motifs. It is a job better done in software than hardware I think. At least until the concept is developed enough to simplify the structures and mutations. So it does ... I missed that. Carry on then. PIC for a similar concept. I case you missed it you might want to take a look at Top Top's Melody Oracle and latest additions to it. On a side note that also reminds me again that I want to make some kind of bit shuffler/rotator for my Chromatic Melody Generator. from a sequence only connected to one input) I actually did start on a design for it once, which I think uses a bunch of muxes. Synaesthesia might have done something like that too. I use arp thingies a lot to grab from sequences ... those clock data in on an input clock and sort it (low to high, high to low, in sequence, reversed, input filtering it too .. on like changed value, or always) and clock it out on an output clock .. a software thing to do yes ... also using a poetry generator .. which picks occurred sequences and determines what to do next from that, software too .. I like to call those things 'listeners' as I think that is what makes them interesting .. to listen to input and output it in some warped way. Envelope followers and pitch detectors would qualify as well. The idea is to have a patch and then some listeners inside of it peeking into it and do some stuff related to what they hear. Some stuff could be analog,some stuff could be discrete logic some stuff would need a computer. The idea of a patch listening to itself is intriguing to me, and it seems to help into evolving stuff .. especially when the response is being delayed in time .. and/or when it is being applied recursively. Re. PHOBos latest post .. shifted sequences are fun .. like when you have an eight step sequencer .. give it an output that i delayed by some some steps. Or when you have a 16 step one where you ,, say .. eight ... use steps 4 - 11 on a separate output .. this is something I do (easily) in software .. but with some muxes and logic should be doable in hardware .. and it is nice to have a lil overlap in the sequences and some difference too in a canon like sequence. Also .. then comes in the M A N IA C subject ... with reversal of sequences, inversions of sequences, disabling steps repetition of steps, setting lengths for steps etc. I did something similar as you discribe in my 16 step sequencer: it has a variable number of repeating steps (1 to 16), where the 16 potvalues go to one output and the last 8 potvalues go to the other output. So if you set the number of steps between 1 and 8 you actualy have two parallel sequencers. Since the sequencer has a cv controllable speed setting, you can use the first 8 potmeters for controlling a VCO and the second 8 potmeters for setting the speed of the sequencer. Note generator -> Note bank -> Key transposer -> tone generator. The note generator creates a valid relative note. For the 7 or 12 note versions it needs to consider the previous and next notes from the note bank. For a pentatonic system it could be as simple as a 4017 and some diodes to select and encode a relative note from I to V.
The note bank holds a sequence of 8 relative notes and can read out those notes on the tempo. More complex banks can scan forwards and backwards. The simple version is 3 x 4015s and a 4053. The 4015s are clocked through on the tempo to read out a note and the 4053 allows the next note to come from the end of the register or be a new note from the note generator. The key transposer takes the relative note from the note bank and applies a key selector to generate the absolute note to be played. It can clock in a new key at the end of any 8 note sequence. The note from the note bank is demuxed to a series of 4052s. Each 4052 takes a 2 bit key selector and the note valid line and creates a signal on one of N tone lines. One half of a 4052 is used for each possible note from the note bank. Something like a 4013 could be used to hold the key. The tone generator take the absolute note from the key transposer and possibly any octave shifts and generates a tone that can be sent to speakers. This tone can be coloured by any of the usual lunetta square wave mangling tricks. The generator could be implemented like PHOBoS' Chromatic Melody Generator. You can drive all these various inputs from a variety of random inputs or you can build a top level melody controller that has a scheme allowing a repeating sequence of key changes and note substitutions to be applied to the other modules. With a consistent interface between each module new modules can be tried and substituted as required. I don't think I am fully grasping the concept yet, but is this what you had in mind for the Note bank ? Yes exactly for the simple version. and I present pins 5, 2 & 11 of each 4015 as the interface back to the note generator so a 7 note generator can decide on a better choice of new note. Also NOR pin 2 of the 4015s, run it through a switch and OR it with NEW/OLD NOTE. The switch is labelled "autofill" (or similar) so that every time a rest is found it tries to replace it with a new note from the note generator. This makes the start up take off smoothly. And pin 5 is the correct pin to take the output from.